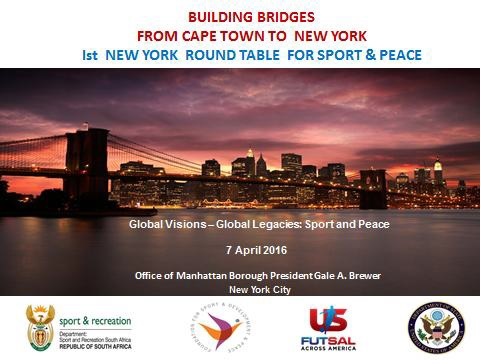 On the occasion of the United Nations‘ International Day for Sport, Development and Peace on 6 April we are happy to present the 1st New York Sport and Peace Roundtable taking place on 7 April 2016 at the offices of the President of the New York City Borough of Manhattan, Gale Arnot Brewer. The event will bring together a unique gathering of local and international individuals from government, non-profit organisations, education, business and media in the field of Sport, Peace and Development. The event will be brought to you by a unique partnership of the Foundation for Sport, Development and Peace in collaboration with New York Futsal, US Department of State, Department of Sport and Recreation South Africa, the New York City Borough of Manhattan and their partners. As South Africa holds the United Nations‘ (IWG) Chair for Sport and Peace and has successfully hosted the 1st and 2nd Cape Town Sport and Peace Conference on the occasion of the Cape Town Marathon and the occasion of World Peace Day on 19 September 2014 and 2015 respectively as well as the 1st Boston Sport and Peace Roundtable in 2015. The 1st New York Sport and Peace Roundtable will follow suit on the occasion of the International Day of Sport, Development and Peace on 6 April 2016 and seeks to promote sport and peace worldwide. What are the challenges young people face in navigating the world of increasing turmoil? What are the opportunities for Sport and Olympic values education to address the challenges facing youth, communities, and nations? What can we learn from examples around the globe of successful sport for social change, cultural exchange and peace building initiatives? The way forward: How can we join together globally to use Sport and Olympic values education to create positive alternatives that celebrate diversity and counter violence and divisions and move towards the achievement of the Sustainable Development Goals (SDGs)? The New York Sport and Peace Roundtable will give an opportunity to meet, exchange and share experiences in the field. It will facilitate discussions, presentations and community experiences in the field of sport, recreation, community and youth in the development and peace context and will address a variety of stakeholders from civil society, government departments, corporates as well as interested parties from universities, colleges, schools, clubs, federations, business and the media. The aim of the Roundtable is to create a forum for exchange and to bring representatives from civil society, business, education, and policy makers together to share experiences, promote communication and the exchange of information to strengthen the vision of using sport, recreation, Olympic values as vehicles to achieve the SDGs and to build peaceful communities and a better society. The envisaged outcome is the start of active networking and collaboration on the topic, sharing and debating of themes related to the focus areas from local, national and international viewpoints as well as building collaboration and an improved understanding of the above issues. The Roundtable also has a strong focus on the youth and local communities to include youth in sport and peace initiatives. It encourages collaboration, stimulates discussions and exchanges and makes theoretical and practical experiences available to interested participants and organisations in the US, South Africa and globally.